Pultruded gratings orthogonal grids consisting of longitudinal bearing bars (often having distinctive miniature I or T cross-sections) and transverse bars(cross-rods) having small irregular shapes consisting of rectangular and circular segments. The longitudinal bars are currently produced in heights ranging from 2.54 to 5.08cm (1 to 2 inches) by a number of manufacturers. The longitudinal bars are typically spaced at 5.08 to 7.62cm (2 to 3 inches) on-center and the transverse bars are spaced at 15.24 to 30.48cm (6 to 12 inches) on center. The longitudinal and transverse bars are connected by proprietary unidirectional E-glass fibers (approximately 70% by weight) in either Isophthalic polyester or Vinyl ester resin matrices. Grating panels are typically supplied in widths of 1.22m (4 feet) and lengths of 3.05 or 6.10m (10 or 20 feet). By varying the pultrusion die shapes, the types of fibers used, and the longitudinal and transverse bars spacing, pultruded grating panels of any bar shape, composite material (provided it can be processes), bar spacing, and size (depending on shipping) can be manufactured. FRP pultruded gratings are simple to manufacture and light in weight. These provide a long lasting solution to ageing infrastructure. It is known for its durability, low-maintenance design, merging corrosion resistance. 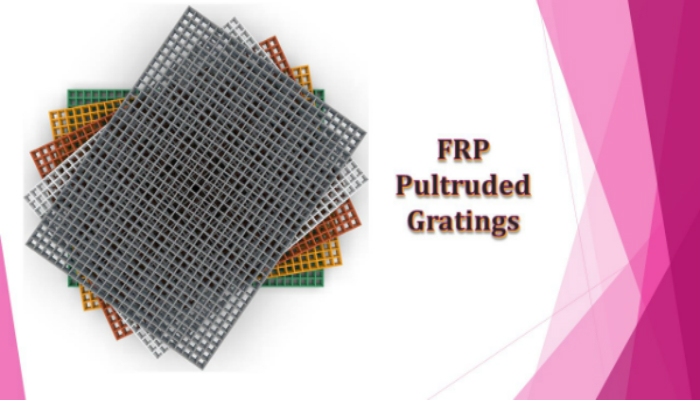 The manufacture of frp pultruded gratings is done in such a way that they are utilized in modern applications which oblige corrosion resistance and quality. These are utilized in an extensive way. FRP pultruded gratings are used for earth pit covers, staircases, floorings, fencing, trench covers, platforms, walkways, elevated car parking, step treads, foot brides, swimming pool overflow, trash and bar screens, mezzanines, cable Trays Systems, Decks, Fencing & Signboards, Electrical insulating sections, Booths, Tank loading platforms, cooling tower sections, building & sheds, trash and bar screens, baying platforms, ladders & handrails and maintenance platforms. Recreation, shipping, architectural, transportation, buildings, industry, power, oil & gas, marine, water and waste treatment, food & beverages, chemical, telecommunications, refineries, power plants, offshore platforms, effluent treatment plants, construction, oil & gas industries, aerospace & aeronautical. What makes people use FRP pultruded gratings? They are easy to fabricate and install. They have long product life and maintenance free. They are anti-skid, anti-corrosion and anti-ageing. They are thermal & electrical non-conductivity & chemical resistant.